Is this luxury smartwatch experience worth it? Louis Vuitton is one of the most well known and beloved luxury fashion houses in the world. It's only been making fancy timepieces since 2002, but now it's jumping into the world of smartwatches with the Tambour Horizon. This is a luxury smartwatch built for the jet setters. Louis Vuitton is not concerned with fitness or metrics – there's no heart rate sensor or GPS here. Instead, it wants to be the perfect wrist-based companion for travelling, and when you're back on terra firma, just looking like a damn fancy smartwatch. The Tambour Horizon isn't cheap. It starts at a eye widening, wallet melting, clutch-your-heart-and-gasp $2,450. But does that luxury appeal make the price point worth it as one of the best Android Wear watches you can buy? And how does it compare to something like the Tag Heuer Connected Modular 45 or Montblanc Summit? That's what we're here to find out. The Tambour Horizon sports a design inspired by Louis Vuitton's analogue watch, the Tambour Moon. It's a large 42mm-wide case that's also pretty thick, lounging at a hefty 12.5mm. It doesn't look its size though, not until you put it on your wrist – but we'll get to that in a bit. The face itself looks like it lacks any sort of bezel, and that's because the bezel is actually used for something: it's where the numbers go. It surrounds a 1.2-inch 390 x 390 AMOLED display that – wonderfully – doesn't have a flat tyre at the bottom. This is a perfect circle, and that helps it blend in with the bezel. Plus, that bezel nicely fits in with LV's watch faces when they're in passive mode, since they don't display numbers. It's a unique design choice that makes the watch look smaller than it is. The big design inspiration it takes from the Tambour Moon, however, comes from the concave design on the side of the watch. This, too, makes the Tambour Horizon look smaller than it is. Like wearing a well-tapered shirt, it's slimming in all the right ways. Also, it makes it very comfortable to grab the watch face when you're swiping across that screen or pressing the digital crown. Speaking of the digital crown, it's the only physical button on the Tambour Horizon. It's got a hefty feel to it. The button itself is slightly soft, and it pushes into the crown rather than the entire crown pushing down. It's a little weird at first, but it also becomes pretty satisfying. Satisfying is a good word for the Tambour Horizon. It feels good to wear, almost an antithesis to the Montblanc, though I also must note it doesn't look or feel too massive on my larger wrist. If you've got a smaller wrist, it might feel like it's swallowing you. The rubber watch band that was provided to me isn't the most comfortable thing in the world, but it also isn't bad. It certainly looks nice, especially if you like seeing the words "Louis" and "Vuitton" on things. There are 30 other bands you can choose from, however. There isn't the level of modularity and customisation that the Tag Heuer has though; this feels more like a designed, curated experience. I would be remiss to not mention the extracurriculars of the Tambour Horizon experience. The charger, too, has nods of luxury. There's a leather buckle on it that you can use to wrap up the cable, which is covered is a knitted material so that it doesn't get tangled. The massive box that you get with the watch is like a miniature cabinet, with drawers for your charger and these strange leather, LV-adorned key covers to protect/decorate your chargers. Yeah, the Tambour Horizon is so luxury you need protection for your $195 charging cable. A charging cable that is, by the way, slightly strange. It's a magnetic charging puck, but it's also very specific about how it is to be used. The only way it'll charge is if you line it up so the power cord on the puck is in the opposite direction of the digital crown. Even while charging on your nightstand in the middle of the night – unseen by anyone's judging eyes – your Tambour Horizon must maintain perfect posture, I suppose. Overall, the Tambour Horizon is a very attractive watch. It's cleverly designed, with lots of subtle details that other smartwatches could take notes from. More than that, however, it feels good to wear. If great design is all about making a product feel good, then the Tambour Horizon is singing its heart out. There's no GPS here, or heart rate sensor, or NFC payment support. The Tambour Horizon isn't interested in anything fitness, and that's because it only cares about being a luxury accessory as you travel the globe. Thus, the biggest features LV has introduced here are all related to travel. The two signature features are LV Guide and My Flight. Before you get to use these two, you'll have to download the LV Link app to connect your Tambour Horizon. This process is supposed to be easy. Your watch displays a QR code, the app has a QR code reader. Except that in practice it's not that simple – it's actually a little glitchy. It took me three attempts to connect properly. Once you do get all that set up, and a Louis Vuitton account registered, you can use LV Guide and My Flight. LV Guide is basically a fancy version of Yelp. If you're in one of seven cities – London, Beijing, Shanghai, Paris, Los Angeles, New York and Tokyo – you'll get a guide that points you to interesting places to check out. You just open the app in one of those cities and it'll start guiding you. My Flight is there to help you get to your flights on time. You email your flight information to a provided email address, which isn't very convenient, and then on your My Flight watch face it'll have a running timer for your next action. So around the watch face will be a line that'll get smaller and smaller as you head toward your boarding time. If you're on your flight, it'll get smaller as you head to your destination. It's a pretty neat, convenient way to get flight information. If you're a frequent traveller, it's definitely something that'll help you tremendously. Speaking of watch faces, they're the star of the show here. There are nine included watch faces from Louis Vuitton, and a lot of them harken back to LV's analogue watches. Those are the Essential Brown and Moon Star Black and White watch faces. They're attractive, but there's an uncanny valley effect to a digital watch face trying to replicate an analogue watch face. The more interesting faces are in the My series. They range in design, from a thick stripe down the centre to pasting the LV logo all over the place to adding widgets to get you to your favourite apps quickly. Each of them also comes with a second watch face that activates when your display goes into passive mode. That's par for the course with Android Wear, but some of them look so good that I wish they were available the whole time. By the way, as noted before, the numbers on these watch faces go away in passive mode, relying on the bezel to tell you the time. The two standouts of the My line are the My 24 Hours and My Classic. The Classic has two little shapes near the bottom that colour up when you have notifications to check out. It's a nice, simple way to let you know what's up. Also, most of the watches have a second hour hand (more like an hour dot or arrow) that lets you keep track of the time in another time zone. So with a quick glance you can not only see what time it is where you are, but at your destination as well. The My 24 Hours watch face – brought over from the Escale watch range – takes this to a whole new level, featuring a lot of little flags representing cities in 24 time zones. The city that's highlighted is the city you're in. It's a tonne of information splashed onto you all at once, and it's definitely visually cluttered, but it's also kind of pretty to look at. There are other small feature improvements LV has slid into there, including unique takes on an alarm, chronometer and countdown clock. They all look pretty and fit in with the overall UI design of the Tambour Horizon. It fits, and they're all features you'd want to use – or hope to use – while travelling. Android Wear 2.0 is on display here, powered by a Snapdragon 2100 processor and 512MB of RAM. There's also 4GB of space for songs and apps and what have you. For the most part, everything is blazing fast and speedy. You still have the Google Play store to download all the apps you need, of course. However, I found myself not indulging in typical Wear apps and the Play Store while using the Tambour Horizon. Instead, I mostly stuck with LV's limited tools and watch faces. 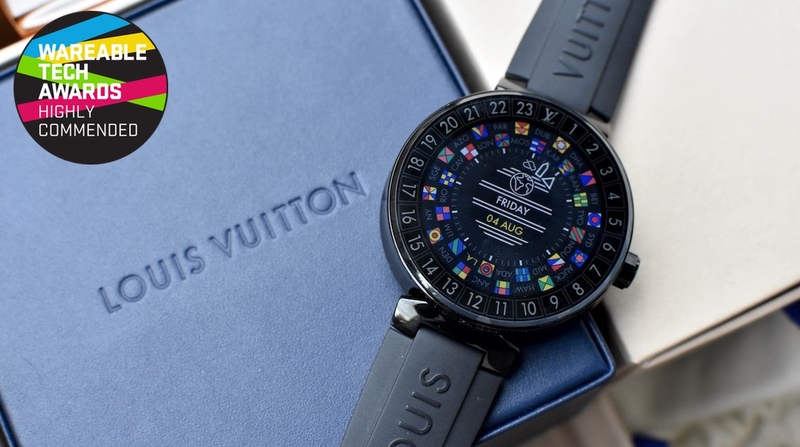 There was a weird disconnect in pairing other apps or watch faces with a Louis Vuitton-designed smartwatch. The watch, and watch faces, are so meticulously designed to craft a Louis Vuitton luxury experience that it felt odd to use anything else. Comparatively, the Tambour Horizon certainly has a more customised Android Wear experience than either the Tag or the Montblanc. The Tag was one of the first Android Wear 2.0 experiences, and doesn't have much outside of customisable watch faces. The Montblanc has more, with both custom faces and an exclusive World Timer app. The Louis Vuitton is definitely the winner in terms of building on top of Android Wear. However, there's a disconnect between Louis Vuitton's customisations and the rest of Android Wear 2.0 that's jarring. Louis Vuitton hilariously promises 22 hours of "average autonomy of battery during normal usage." Translated, that means about a day of battery life. I was actually able to squeeze out more than that on a couple of occasions, getting about a day and a half at most. When you do need to charge, you might have to wait for a bit. It took quite a while to get back up to 100%, definitely longer than something like the Fossil Q x Cory Richards or an Apple Watch. That could be because of the specificity of the charger, which throws a fit if you don't get things perfectly aligned. Or it could just be that – for whatever reason – the watch takes forever to charge. Either way, make sure you fill it up before you take your flight. The Tambour Horizon is a luxury watch. It feels good to wear, it looks good and it has all the care and detail that a luxury watch should have. It's also heavily focused on travel, with some nice features to ease your global lifestyle as you go from airport to airport. And hey, it'll match your luggage. But even if you're not a frequent flyer, it has appeal in its designer look with that Louis Vuitton name. If you can afford its steep price and really want a smartwatch to match your decadent lifestyle, then this is for you.